Did The Founding Fathers Support Hemp and Cannabis? 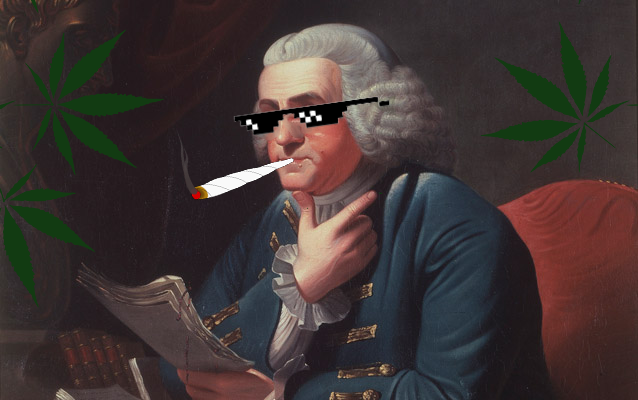 Ever wondered what America’s founding fathers would think about cannabis legalization today? All things considered, there’s a good chance they’d rejoice about the rapid rise of cannabis reform. After all, “early letters from our founding fathers refer to the pleasures of hemp smoking.” This is according to Dr. Burke and we can trust his opinion, since he is the president of the American Historical Reference Society. Burke claims that seven of the earliest presidents of the United States were hemp smokers. They include George Washington, Thomas Jefferson, Benjamin Franklin, James Madison, James Monroe, Andrew Jackson, Zachary Taylor, and Franklin Pierce. Many of the men who shaped America throughout history did so by advocating hemp use in the process. Thomas Jefferson was on the receiving end of the first ever patent in the U.S., and it was for a hemp threshing machine. Jefferson was renowned for helping to diversify the plant’s genetics after he smuggled seeds across China, France, and America. They often wrote about the benefits of hemp vs. tobacco. Perhaps they even wrote about it on hemp paper, just like The Declaration of Independence, Thomas Paine’s “Common Sense”, the Federalist (and Anti-Federalist) Papers, the Articles of Confederation, and the United States Constitution were. The paper mills used to process hemp into parchment were owned by Benjamin Franklin. George Washington did not keep his hemp cultivation practices a secret. Throughout the course of his life, he cultivated hemp on Mount Vernon for industrial uses. String fibers contained in hemp were useful for creating sail canvas, rope, clothing, and fishing nets. Washington even contemplated between tobacco and hemp during the 1760’s, as he tried to determine which could yield more profit, before settling on hemp. The topic of CBD (cannabidiol) has been mentioned in the media a lot more over the last couple of years than ever before. Scientific research has served up a dish of cold, hard facts and evidence pointing to the plant’s non-psychotropic chemical compound, which boasts therapeutic qualities that have caught the attention of Big Pharma. Experimentation and technological advancements have triggered a wave of consumption techniques, including inhalation, ingestion, topical application and sublingual application. Consequently, this has driven consumer demand to sky-high levels. While it might be a fairly fresh topic, hemp isn’t a new trend by any means. America’s first cannabis law was enacted at Jamestown Colony, Virginia back in 1619. The law ordered all farmers to cultivate Indian hempseed. Failure to do so could have resulted in a fine or jail time! Decades had passed until hemp cultivation was made possible under state-controlled pilot programs as per terms of the 2014 Farm Bill. This bill permitted industrial hemp cultivation; something that the U.S. Department of Agriculture says has resulted in the land area of harvested hemp more than doubling on an annual basis. With the passing of the 2018 Farm Bill, which President Donald Trump signed on December 20 of last year, the low-THC, high-CBD plant can now be grown and regulated like a regular agricultural crop. Oh, how the founding fathers would be proud. Sponsored by influential U.S. senator and the chamber’s majority leader, Mitch McConnell, the 2018 Farm Bill would permit hemp cultivators to gain adequate (and essential) coverage from federally-subsidized crop insurance. Hemp won’t get you high, so while you probably wouldn’t have been crippled in fits of the giggles if you did smoke a joint with one of the founding fathers. However, its medical uses are so widespread that you’d likely melt into a conversation about its therapeutic benefits. In fact, in June of last year, the hemp plant’s medicinal compound CBD was approved by the FDA in the form of Epidiolex – a cannabis medicine for epilepsy. Taking into account it’s myriad uses, hemp is a lucrative commodity that will surely yield different results to cannabis legalization. There will be a heavy focus on the medicinal aspect of the hemp plant’s non-psychotropic cannabinoid CBD in 2019, not to mention its suitability as a commodity in other industries.